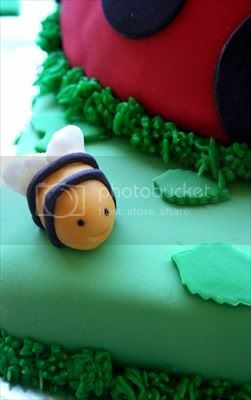 PLAYING WITH SUGAR: Fondant doesn't "bug" me anymore - my very first fondant cake! Fondant doesn't "bug" me anymore - my very first fondant cake! Fondant fears be gone!!!! Yep, you are reading this right - I did it, I finally faced my fondant fears head on and made my very first official fondant cake this weekend. Let me tell you at first I was ready to throw in the towel and go back to what I know best - butter cream BUT I knew that in my heart of hearts IF I ever in my wildest dreams want to open any type of baking business that I MUST start to work with fondant. So that is just what I did! How do you make sure that they are no flaws in the fondant - no creases, no dimples, no stray finger nail marks as you smooth it out and what do you do if you happen to have one once it is already on the cake? How do you use enough icing base under the fondant but yet make sure it doesn't come out under the fondant when you are smoothing the fondant onto the cake? When you are putting the cake together, do you torte the cake (even if it is a small cake) so that there is plenty of icing along with the marshmallow fondant? Is there a way to get the fondant to look shiny after you have it all in place? I just used a pastry brush to brush off all of the excess powdered sugar after the entire cake was finished. I used a regular 13x9 cake for the base and the Wilton Sports Ball pan set for the lady bugs (instead of putting the pans together to form a ball, I kept them separate). 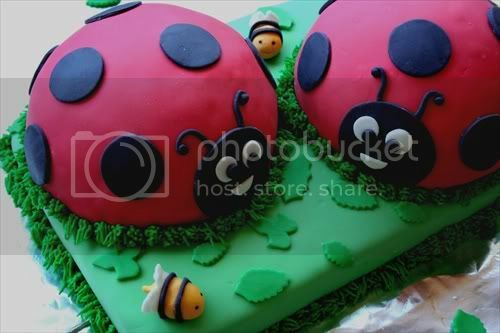 I used various fondant cutters and flower cutters for the shapes and leaves as well as using Wilton decorating tips to create various looks on the lady bugs. 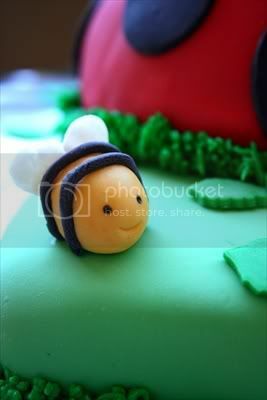 But my favorite part was using the fondant to make these little bees. I mean seriously how cute are they???? Thanks for looking and I appreciate any and all feedback that you can provide to me! You've GOT to be kidding about this being your first fondant cake!!! I stray away from cake decorating because I stink at it, so I have no advice and I can't imagine any pros telling you it doesn't look great. No really, I understand what kind of pointers you're looking for. There's NO WAY this cake would ever end up on Cake Wrecks. 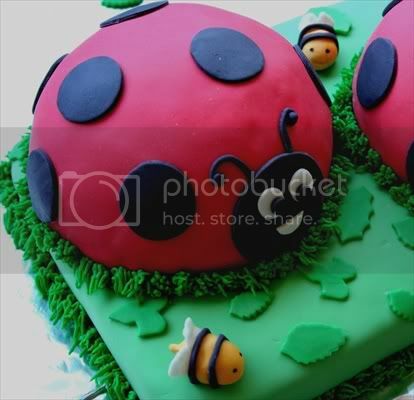 One of my nieces (nicknamed Lady Bug) would love this! And yes, I LOVE the bees! P. S. Another main reason I've never bothered with fondant (besides the fact that no one at my house really likes cake) is because I only tasted it once (at a baby shower) and I did not like it at all. Are you saying they probably used packaged fondant and the real stuff tastes good?! Tempting! That is awesome! What a great cake, let alone your FIRST fondant cake...amazing! I have just begun using fondant to cover cakes...I was scared too, but like you said, you learn so much by just DOING it!! What food color did you use to get the black? I have tried making black and it just gets really sticky because of all the color I have to add to it. The MMF tastes the best, but if you try Satin Ice fondant, it actually tastes pretty good...also it is a little easier to work with...that's just my own opinion, though. So, so cute! Great job!! My first (and so far only) fondant cake was a bit of a disaster, so I am beyond impressed that this is your first! This cake is beautiful - looks totally professional and just darling! Saw it on Foodgawker and had to check it out...very nice job! A fondant smoother works really well (looks like a small plastic iron) for smoothing out the surface. I use a slightly thinner coating of icing than I would for a buttercream-only cake. I've never had a problem with icing squeezing out of the bottom - maybe use a slightly softer touch when smoothing? I do tort the cake - usually I have a filling that is a different flavor from the icing. How shiny are you trying to get the fondant? I only roll on one side, and the bottom has a slightly glossier sheen than the top. You can also use pearl dust or spray for that shimmery look. I just made my first wedding cake, and it was covered in fondant. It was easier than I thought it would be. One question for you - how did you get such rich shades of red and black? It usually takes a TON of coloring to get hues that deep. Awesome Awesome Awesome! I am blown away by your cake and being that it was your first fondant cake is just CRAZY!!! How did you get such a deep black and red? That looks amazing! I know when I did my first fondant cake which was in the shape of a snowboard (I couldn't do just a normal cake, I had to pick something crazy for my first time lol)it was SO frustrating. It was ripping and there were a bunch of cracks. But in the end I was pretty happy with it. But yours looks like you have been doing this for years! Great job! WOW! I just spotted your cakes on food gawker. That is a fantatic cake! I am deathly afraid of even trying fondant. Ahhhh so cute! You look like a pro! Just have to say on this one that I had the pleasure of tasting this cake!! It was wonderful! We hated to cut it for our party, but oh what a joy to eat! Thanks so much for all of your kind words and helpful tips! You all are a great confidence booster!!! As for how I got the deep red and black - the short answer is I don't know, probably nothing short of a small miracle? LOL Honestly I didn't use too much coloring (no more than I would have used to make a deep red royal or butter cream icing). I used Wilton no taste red and black gel colors. I rolled out my fondant into a log type shape, swiped on a few strokes of color with a toothpick and then folded it over onto itself, kneaded, and just kept repeating the process until it was well blended. With each “fold” I would just keep adding color until the desired shade was reached (but as I said I didn't use to much just A LOT of kneading). I will tell you this, the next day either from the kneading or the rolling I my arms and hands were VERY sore!!! This goes to show you how out of shape I am!!! I'm new to your blog and I'm glad to see you've conquered the hard world of fondant. I have yet to master it!!! I'll pick up your tips and apply them to my next cake! What a fantastic cake! You did such a great job. so cute, you did an amazing job! Just found this on FoodGawker, great ckae! I do know how pros make their fondant shiny, but you have to use a steamer...like the kind they steam clothes with. Seems to make a huge difference, but not something everyone would have lying around. Wow wow wow! You did a fabulous job on your first fondant cake. I'm thinking you're hustling us though. This can't be your first! It's awesome. Love the ladybugs. Great job! Two huge thumbs up. It looks great! That bee is too cute. The ladybugs look fabulous too! Ok Fondant and I have a bad relationship also. But I have made some cakes before. Nothing spectacular. But your cake came out great!. I love it. If I had a little girl to make it for I would run out and try my hand at it. Ok, this is too cute!! I'm totally saving this - I think this might be my daughter's first birthday cake! You go girl! Kudos to you for jumping right it and winning the battle. Not only did you use fondant but you made your own AND your cake looks terrific! Absolutely ADORABLE!!!! i havent tried working with fondant yet but this cake inspires me! Wonderful job! I have yet to work with fondant (purchased or homemade) which is something I've always wanted to try. Can't wait to give it a go - Thank you for the inspiration! just a tip..although your fondant looks better than any I have done...lightly smear your work surface with vegetable fat (trex) then add a light dusting of icing sugar...this really works - I have just had to cover 6 12" square cakes and tried this out and no sticking - also used less buttercream - just a thin layer-than I had previously and used a smoother and my hands (clean and dry and sugar free) to 'polish the icing' - worked a treat!